In 1945, at a meeting of the [[Mennonite Research Fellowship (Bluffton, Ohio, USA)|Mennonite Research Fellowship]] in [[Bluffton (Ohio, USA)|Bluffton, Ohio]], historian C. Henry Smith proposed that American Mennonites translate and expand the <em>[[Mennonitisches Lexikon|Mennonitisches Lexikon]], </em>a German project that had been nearly halted during World War II. Smith and his colleagues formed a <em>"Lexikon Committee." </em>Three years later, the scholarly effort had grown to include a network of editors and a 50-member council representing 13 Mennonite groups and 6 non-Mennonite denominations. Smith's death in 1948, however, was a blow to the project. An enduring legacy of the <em>Mennonite Encyclopedia </em>is the sense of denominational pride which guided its editors. 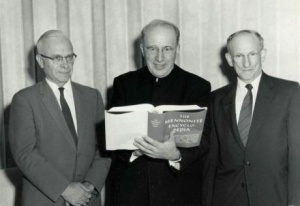 Some contemporary scholars suggested that the <em>Encyclopedia </em>enabled Mennonites to establish themselves as a mainline Protestant church body during the post World War II years. Indeed, the publication of this inter-Mennonite reference work became a celebrated moment in the denomination's history. Goossen, Rachel Waltner. "Mennonite Encyclopedia, The." Global Anabaptist Mennonite Encyclopedia Online. July 2011. Web. 22 Apr 2019. http://gameo.org/index.php?title=Mennonite_Encyclopedia,_The&oldid=121823. Goossen, Rachel Waltner. (July 2011). 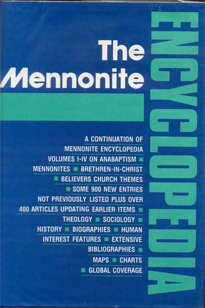 Mennonite Encyclopedia, The. Global Anabaptist Mennonite Encyclopedia Online. Retrieved 22 April 2019, from http://gameo.org/index.php?title=Mennonite_Encyclopedia,_The&oldid=121823.